Two friends and I share a community garden. Gary Lennon does the lion’s share of the work. Gary wrote this. I am publishing it because it also is a great observation about life and politics. I’m into flowers and I’m not going to apologize. I leave them in the ground. Ditto on the forget-me-nots – who wants their garden forgotten? If nasturtiums come back, I’ll transplant them to just where I want them. Every year, they come back. Purple potatoes shot through with orange nasturtiums define the look of our little hillside Eden. I left tall stands of Russian blue kale standing to go to seed. These kales have contributed to many a meal. Next year the upper bed will be full of seedings in the spring, and I will transplant and thin them, as I did with these giants three years ago. 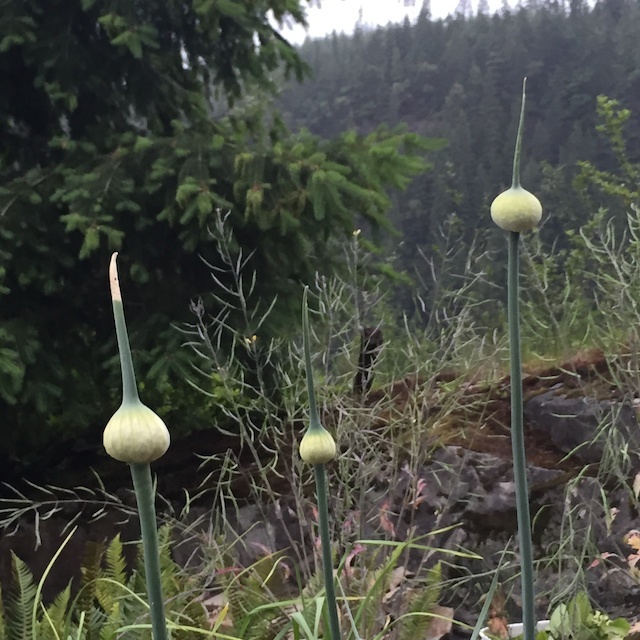 Notice the leek blooms – I saved a quarter row to flower (the blossoms are wonderful) so I could collect their seeds. Little dinosaur kale is from last fall – it wintered over and now will grow huge for fall. This is me (Scott) again. Here is a link to video series I have done on “Gardening and Government” which shares my thoughts about how government could be improved if our officials thought of themselves more as “gardeners” than rulers who can ignore our organic law. You can watch the videos by clicking here. Tagged Congress, Constitutional Republic, DelBene, flowers, gardening, gardening and government, Libertarian, organic, politics. « DOES TRUMP’S CRITICISM OF FEDERAL JUDGE HAVE MERIT?